Find My Workspace lists over 95% of the serviced offices market in Business Bay. Simply click Request Quote to check pricing for one office, or Add to Basket for multiple offices. This business centre is an exquisite solution provider for prestigious furnished offices, conference and meeting rooms along with the ultimate business packages. The offices give you a stunning view of the waterfront and Burj Khalifa. The space offers exclusively furnished offices of different sizes and capacity; meeting rooms, personalised telephone answering, stylish visitors’ receptions, secretarial service, high-speed Wi-Fi, advanced telephone, voice mail system & much more. All business package services include personalised telephone answering, mail management, a prestigious business address, concierge services and meeting rooms. The centre’s support has been selected carefully and structured to make sure you are always connected with the best tech infrastructure with no moment lost. You will also benefit from 24 hour access to the centre, with key card security, making sure your work space is as flexible as you. Other amenities of the business centre include outdoor swimming pool, running track, gym, aerobics room and on-site cafeteria. This contemporary and luxuriously furnished professional business centre offers premium and exceptional quality workspace solution packages ideal for clients of any industry or background. The centre is set within a large and locally renowned landmark office building, providing a significantly wide range of high quality and exceptional facilities for all occupying clients as standard; including spacious meeting rooms, high speed internet connections, comfortable breakout space, on-site support and assistance, flexible terms, exquisite furnishings and a vast array of technical equipment available to all tenants. This workspace was established in Dubai in 2007 by a multinational group of investors, well-respected and well-connected in the MENA region and beyond, and with an extensive combined experience in the business centre, hospitality, and tourism and aviation industries. 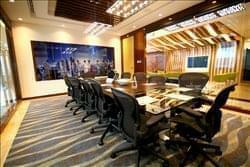 This centre takes pride on being a reliable provider of serviced offices, virtual offices and meeting rooms in Dubai. There are several options and packages to meet the dynamic business requirements for a full-time office, part-time office, branch office, start-up office, meeting room, collaboration room and hot desk. This space offers rental solutions guided by the principles of flexibility and affordability. The centre offers fully furnished offices, designed by some of Dubai’s finest interior designers with ergonomically designed chairs and tables to suit our client’s health and lifestyle. Tenants also have access to modern IT systems, communication facilities, as well as a variety of administrative support services in a diverse range of smart and flexible packages. What makes this centre unique are the elegant business class lounge, splendid break out area and sophisticated interiors. To obtain information for your selected Business Bay Serviced Offices, please tick the "Add to basket" box for each office you prefer and complete the form below. We will then send a detailed report via email.